In November 1915, several Old Boys were working in the Italian Unit of the Red Cross Ambulance Unit, along with Mr. G. M. Trevelyan, the historian of Garibaldi. An urgent appeal for help reached the headquarters of the unit when a small building used as a cholera hospital in the village of San Florian was bombarded by Austrian guns. Mr. Trevelyan and some men removed the inmates to a place of safety. “Two days later a similar thing happened. Mr. Trevelyan and six ambulance cars came to the rescue. The rear half of the building was already a mass of ruins, among which lay a dozen dead; the Italian officer in charge of the hospital was killed whilst standing side by side with one of the unit. All surviving patients were successfully carried off in the British cars. Augustine N. Grace (1890-91) and J. H. Gray (1897-1902) were in the rescue party. In February 2016 I gave a talk about the archives as part of the Thursday lunchtime Recital Room series (click here for the full programme). I’ll put the talk on the blog in a series of posts. The second installment is below. Click here for the first installment (about Arthur Rowntree’s views about leisure activities). I’ll start with sport. Cricket seems to have been played from the very early days of the school. Here are some of the rules of the cricket club about 1834 when the school was still at the Lawrence Street site – the question of who paid for broken windows appears to have been particularly important. That the Club shall pay for no windows broken by non-subscribers. That all non-subscribers playing when a window is broken, shall pay 1d. for a 1s. window, and 3d. for a 3s. 6d. window. That the Club will pay for no windows broken at single wicket, or when less than four subscribers are playing. That if a subscriber breaks a window or bat, or loses a ball, he shall pay half, and the Club the other half, but if a non-subscriber he shall pay all. That the balls or bats shall not be lent to play at any other game but cricket, under penalty of one penny. That if any other subscriptions should be afterwards wanted, those subscribers who do not pay them shall be subscribers no longer. That no non-subscriber shall play when there are more than eight subscribers playing, unless he is particularly wanted to make sides. That whoever throws any of the bats shall be fined the sum of 1d. That none of the bats and balls shall be used, except there are two subscribers playing. 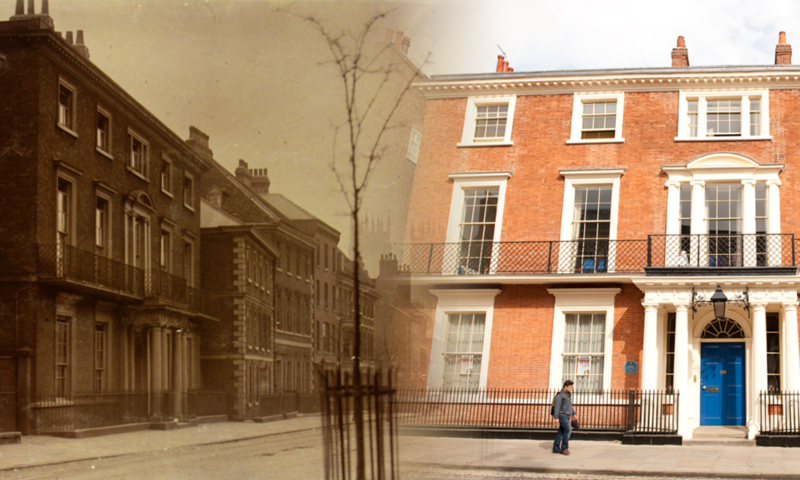 Walter Sturge, who was at the school between 1844 and 1846, therefore was at both Lawrence Street and Bootham, didn’t play cricket until the school moved to the Bootham site, suggesting that at some point after the rules had been written, cricket was banned. The earliest minute book we have for the cricket club starts in 1865 and runs till 1867, and the first outside match listed in that is against Ackworth in May 1865, although all the matches listed in that minute book are either internal matches, matches against Old Scholars or against Ackworth. The next record we have is a score book that runs from 1886, which contains a much wider range of opponents. In the First World War, many thousands of Belgian refugees came to Britain and relief committees were established to help them. Quakers in York played an important role; several families were housed at the garden village of New Earswick, founded by the York philanthropist Joseph Rowntree, and money was raised both to support them and towards Belgian Relief Funds. It has already been mentioned in earlier blog posts that Bootham school supported a Belgian refugee family See previous posts from September 1914 and January 1915.